Why should experiential education be only for the students? Teachers deserve their own path to DIY greatness. and walk you through the entire 3D printing process. Have your teachers and students learn in their home environment; the knowledge transfer will smile upon you. We offer the possibility to have both student and faculty groups building 3d printers alongside in the same workshop! ‘Learning together’ as a way of fostering a communal ‘making mindset’ is proving especially effective for schools starting making and tinkering programs anew. This feature is Completely Optional. We are perfectly comfortable running a more classic professional development with teachers only. 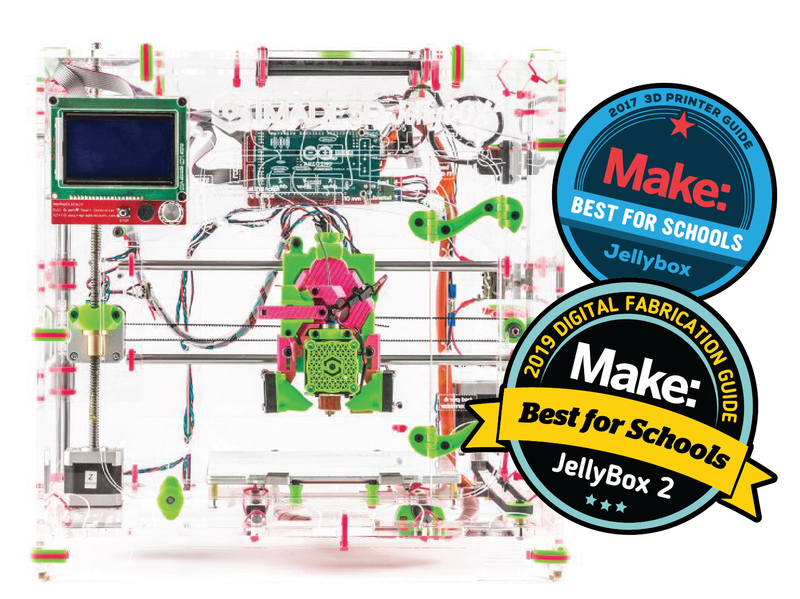 Awarded “Best For Schools 2017” by Make Magazine! CONTACT US TO SCHEDULE a BUILD and DISCUSS YOUR ORGANIZATION'S NEEDS. WHY WAIT? We hold that two days are better for most schools – we can cover more ground, and the attention span holds better. Is my school a good fit? We have worked at elementary, middle school, AND college level. IF you are still reading this, rest assured, your school is a good fit. Talk to us. Do you also do builds for general public and organizations other than schools? Glad you asked. A growing number of makerspaces are getting on our bandwagon. Check out the JellyBOX Quick Build section. You can also get the JellyBOX as a DIY kit and self-educate yourself.